First announced at the end of 2006, Obsidian’s Aliens: Crucible went through most of its production in quiet until it was officially cancelled 3 years later. Since then we’ve slowly learnt more and more about the first attempt to bring Alien in the RPG world. Last year GVMERS produced an enlightening mini-documentary on the game and Josh Sawyer, Creative Director for Crucible, spoke candidly to IGN about the internal struggles faced at Obsidian. Yesterday VG247 shared a new interview with Chris Avellone, the writer of Aliens: Crucible who spoke about the game, comparing it to Mass Effect but with a focus on maintaining the fear factor! 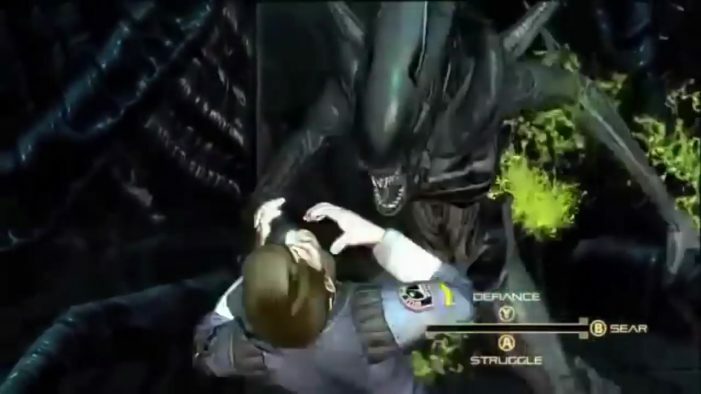 Screen capture from Aliens: Crucible gameplay footage. Crucible’s writer went on to explain how they tried to keep the fear going, making it possible for the Aliens to show up and interrupt you even while engaged in exchanges with other characters. 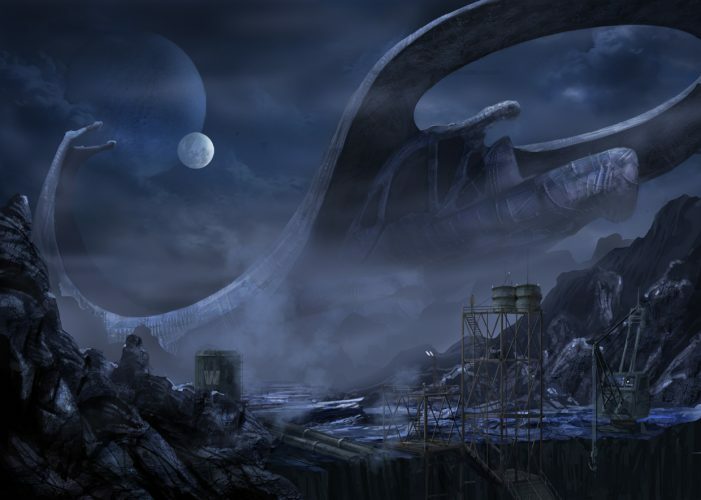 Concept art of a Space Jockey facility or craft. Avellone also went into some more detail about Aliens: Crucible’s narrative, explaining that everything went wrong for the planet after the discovery of a Space Jockey facility! How do you feel about Aliens: Crucible? Are you disappointed it never saw release and Aliens remains outside of the RPG format? You can check out 13 minutes of gameplay footage below! That could have been really good or really bad. I'm disappointed we didn't get to find out. Gutted this looks like so much fun. imagine how good it would have been finished. I love their games so I might be bias. Concept had alot of potential, the lead-ins and the environments felt dead-on too. But alas this franchise had a deadlock in the clutches of sega killed it before it could get off the ground. Would be cool to see a modern concept of this game. @Xenomorphine: I suspect they meant the game would be similar to any Bioware RPG. Character creation looked like typical Bioware character creation. The array of responses, 3rd person view, all that. The player's decisions and approach to situations might also have some effect on the character's development or capabilities. It's just too bad baby. Nice looking graphics, love that Alien head! Just because the player could have sent simplistic commands to two AI supporting characters during combat, doesn't make it "like 'Mass Effect'". It's a weird comparison for them to have made. It's a function which existed well before that game did. Too bad it was never released. Looked like fun. Kinda divided if I think the RPG idea would work with Alien. Head says yes, heart says no. Concept art is nice one.